The name Champfleurie - French for 'flowering fields', dates back to the 15th century and is said to have been given by Mary Queen of Scots, who often visited there. The legend is that the Queen herself, when visiting for the first time, exclaimed "C'est un vrai champfleuri! ", thereby giving it it's name. It is situated 2 miles east of Linlithgow Palace in the Royal Burgh of Linlithgow where Mary Queen of Scots was born. It has many historic connections, amongst which, it was once the home of two of Mary's ladies in waiting, the palace horses were stabled there and Bonnie Prince Charlie is said to have rested the night at Champfleurie on the last stage of his triumphant march on Edinburgh in 1745, while his troops bivouacked at Threemile Town, a mile or so to the east along the Edinburgh Road. The present house was built in 1851 by Admiral Robert Johnston Stewart of Physgill and Glasserton in Wigtownshire and was occupied for much of the 20th century by Sir Francis and Lady Tudsbery, whose son Robin was an equerry to the late Queen Mother. The grounds of Champfleurie as they are today were designed in 1792 by the famous landscape architect Thomas White who was well known for his work at Scone Palace. At that time Champfleurie Estate amounted to over 3000 acres and was bounded by the estates of Dalmeny and Hopetoun. 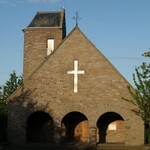 It has been the home of the present Laird of Champfleurie, Ricky Kerr and his family, since 1987. Sir Francis Cannon Tudsbery CBE (1888-1968) and Lady Isabella Tudsbery moved from London to Champfleurie in 1921 when their son Robin was just 2 years old. Lady Tudsbery had an intense love of nature and kept birds of every kind in her spacious aviary. There was even an owl which she was able to call down from the trees. Francis Tudsbery lectured in merchant law and many references can be found to a book ' Law Merchant and the Common Law which he published in 1918. A book containing his lecture notes was found down the back of one of the library bookcases in Champfleurie House long after the Tudsberys had died. Francis Cannon Tudsbery CBE (1888-1968) was awarded a knighthood in the queen's Honours List in 1954. When Robin Tudsbery was killed in the final hours of the Second World War, his parents set about creating a shrine to their only child. Today, 52 years after Sir Francis and Lady Isabella Tudsbery built Robin Chapel in Edinburgh, its trustees are opening its doors to the public. The 25-year-old lieutenant in the Royal Horse Guards was blown up by a mine as the Allies completed their final push through Germany. Liz Mackay, of the Thistle Foundation which looks after Robin Chapel, said: "This is a unique opportunity to take a tour around this very special building. "It is a very important focus point for us all here, but we have never before had an open day like this. Being inside is a very moving experience. Sir Francis and Lady Tudsbery's son was buried in Germany where he was killed, but this is the shrine to his life." Lt Tudsbery came from a wealthy family with a tradition of service to the nation, and joined up in 1941 after graduating from Cambridge. He was killed with his crew as their armoured car was blown up by a mine crossing a bridge in north-east Germany. The news was broken to his parents within hours of the announcement of the ceasefire that marked the end of the war in May 1945. While the nation celebrated victory, Sir Francis and Lady Tudsbery went into mourning at the family mansion, Champfleurie House in Linlithgow, the birthplace of Mary Queen of Scots. By 1945, with the end of the war in sight, the wealthy couple were already planning a housing complex for some of Scotland's most severely disabled soldiers. After the death of Robin, they devoted the rest of their lives to the project and built the chapel in the grounds to his memory. Few people know of its existence, hidden away in the 22-acre Thistle Foundation complex in south-east Edinburgh, where disabled people are still looked after today. Every detail of the chapel is a reminder of Lt Tudsbery's life, even down to the candlesticks and cross on the altar cast from the melted silver of some of his personal possessions. The Robin Chapel is one of more than 700 buildings all over Scotland that are opening their doors to the public this month. Martin Hulse, of Edinburgh conservation group The Cockburn Association, which has helped to organise the Doors Open event, said: "There are dozens of places open to visitors, but the Robin Chapel would be at the top of my list because it has such a remarkable story behind it. "You would never have thought of a Fifties building being listed, particularly not one in the middle of Craigmillar." The Thistle Foundation was established in 1944 to provide suitable family housing and medical support for disabled ex-service personnel and their families. As time has passed, this provision has been extended to include people with disabilities who have no service connection. The Founder and his wife, Sir Francis and Lady Tudsbery, had witnessed the consequences that resulted in the lack of adequate housing and support for disabled service personnel after the First World War. Many of these people had to spend the remainder of their lives in long stay hospital care, which added significant extra strain and financial hardship for relatives. This frequently led to the breakdown of family life. Sir Francis's vision was for a community supported by professional staff that would create as normal an environment as possible for families to live together in comfortable circumstances. "The first occasion that my sister can recall concerning The Thistle Foundation is being present at Champfleurie, the Tudsbery family home, before the start of the Second World War when my uncle, Sir Francis Tudsbery was discussing his ideas with his only son Robin. Even at this time there were severely disabled servicemen returning to this country from various parts of the world who had nowhere to go except a hospital. Sir Francis felt strongly that these men should have somewhere to live with their families and have the necessary medical facilities on hand. He had recently seen a facility in Chelsea, which was running on similar lines, and so began the long and arduous task of raising the funds to form The Thistle Foundation. As a boy I remember meeting The Duke of Buccleuch who told me that my uncle had approached him to help the fund. The original donors were so generous that not only was there enough money to purchase the land and build 103 houses and clinic, since renamed the Tudsbery Centre, but there was sufficient left over to cover running costs for several years. Then the shattering news came to Sir Francis and Lady Tudsbery that their son Robin had been killed in action a few days before the end of the war. They then devoted the rest of their lives to The Thistle Foundation and built the Robin Chapel, which stands in the centre of the Foundation. The chapel was in memorial to Robin and also "to further the spirit of unity and concern among Christian people". Her Majesty the Queen Elizabeth opened the Foundation on 5th September 1950 and the same day Her Majesty laid the memorial stone to Robin on the inner wall of the Cloister entrance to the Chapel. In recent times, The Thistle Foundation has been challenging many of the traditional assumptions made about the care of disabled people. Whereas, previously, health would be taken to mean physical fitness, the Foundation has sought to broaden this scope to encompass emotional and social well being. Staff, individuals, families and friends look to enhance the quality of lives in all its many facets. It's all part of person centred planning - The Thistle Foundation offers support; the individual remains in control. The Thistle Foundation's person centred planning has been recognised as an innovative and positive step forward and local councils are now purchasing the expertise that has been developed with staff to provide personal assistants for disabled people living outwith Cragmillar. Underpinning the work of the Foundation is the philosophy that disabled people can and should be part of their local community. The Thistle Foundation works with many organisations, social work departments, disabled people and their families. In 1946 Sir Francis Tudsbery wrote "When the benefits of this novel and humane undertaking are fully understood, it is thought that the misery and mental distress caused by the prolonged separation of invalids from their homes will no longer be tolerated, and that this new conception of institutional treatment carried on in the comforting and contented atmosphere of an unbroken family life will be regarded as an essential provision in the case of all patients requiring long-term care and attention"
Over the years the language may have changed, gone are the days when disabled people are referred to as patients and invalids. However the vision still holds true today - all disabled people should have the right to live in their own home with their families. The gentleman responsible for the building of the current mansion house of Champfleurie completed in 1851 as well as redevelopment of a number of farms in the estate . In April 1904 the Linlithgowshire Journal and Gazette reported that Captain Johnston Stewart of Champfleurie died unexpectdly at the age of 50, in Avignon, France. He also owned estates at Glasserton and Physgill in the county of Wigtown in South West Scxotland. Admiral Robert Hathorn Johnston Stewart, C.B., M.V.O., Royal Navy, Retired (20 May, 1858 - 23 May, 1940) was an officer of the Royal Navy. In July, 1871, Stewart was ranked twenty-first in order of merit of thirty-five candidates accepted as Naval Cadets following the entrance examinations. He was promoted to the rank of Lieutenant on 15 February, 1882. and the rank of Commander on 31 December, 1895. Stewart was promoted to the rank of Captain on 6 September, 1900. He assumed command of the first class protected cruiser Gibraltar in December 1904 and was appointed to command of the armoured cruiser Monmouth on 8 August, 1905. He also served as captain of Goliath from October 1906 until the following December, when he moved to Africa until June 1908. He was appointed Captain Superintendent of Sheerness Dockyard on 1 July, 1908 and promoted to the rank of Rear-Admiral dated 8 September, 1909, vice Marx.. In accordance with the provisions of the Order in Council of 8 December, 1903, he was placed on the Retired List, at his own request, dated 9 July, 1912. He was advanced to the rank of Vice-Admiral on the Retired List on 15 July, 1915] and to the rank of Admiral on the Retired List on 1 September, 1918. David Rhind - Architect of Champfleurie? Although the original drawings of the current Champfleurie House are unsigned it is believed that based on the style and design of other buildings in the area attributed to David Rhind's work, that he was the architect of this Scottish Baronial Mansion in 1851. Architect. Born in Edinburgh, Rhind trained with the architectural practice of Augustus Pugin in London. Rhind's notable buildings include the Commercial Bank of Scotland in George Street (Edinburgh), which is now The Dome cafe and bar and, also another Roman-style building for the Commercial Bank, in Gordon Street (Glasgow). In Edinburgh's Chambers Street, Rhind was responsible for the old Watt Institution (now part of the Edinburgh Sheriff Court complex). He came close to winning the competition for the rebuilding the Houses of Parliament in London (which was won by his old master Pugin and built between 1840-7), but Rhind was able to re-use his design for Daniel Stewart's College in Edinburgh. Canal Museum, Boat Trips, Tearoom and much more. Old Maps of your area.